LWF is uniquely positioned to link science with action. Together, we are speaking up for the health of fresh water – and the future of Lake Winnipeg. We encourage individuals to take action at home, at the cottage or within communities. We also work behind the scenes to bring the collective voice of our membership to the tables of decision-makers. Using the Lake Winnipeg Health Plan as a road map, we advocate governments for evidence-based solutions to manage phosphorus loading across the watershed. Browse our policy submissions below to learn more about our recent advocacy efforts. Manitoba Sustainable Development solicited feedback on proposed regulation governing drainage. Our submission reinforces that amendments to regulation must comply with the legislated requirement for no net loss of wetland benefits. Our recommend changes include: prohibiting drainage of Class 3, 4 and 5 wetlands; changes to mitigation and compensation schemes to ensure their effectiveness; the creation of a comprehensive provincial wetland inventory prior to the launch of the registration process; and ongoing auditing, monitoring and evaluation processes. In advance of Budget 2019, the Manitoba government solicited input on how provincial spending and revenue should be prioritized. 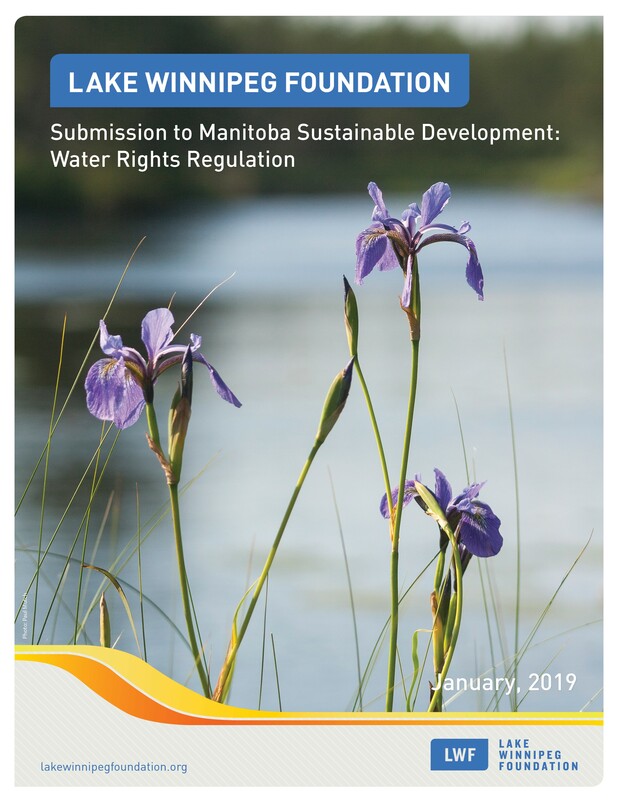 Our submission highlights the government’s responsibility for the sustainable management of provincial water resources, recommending investments in wetland protection, Winnipeg wastewater treatment, data sharing and aquatic invasive species prevention programs. Bill 7 proposes to amend existing legislation to improve provincial watershed management. Our presentation to the Standing Committee on Legislative Affairs supports amendments to enable new drainage regulations that will increase administrative efficiency, improve enforcement and protect more threatened wetlands. LWF also supports amendments that enable evidence-based nutrient targets to be set throughout Manitoba. We identify several opportunities to strengthen Bill 7, by enabling efficient and cost-effective upgrades to improve sewage treatment in the City of Winnipeg, and ensuring new monitoring regulations are subject to public consultation. The provincial government solicited feedback on a proposed framework to support environmental protection, natural resource management and sustainable development that recognized water as one of its key pillars. Our submission recommends strengthening the proposed plan with the addition of measureable targets and timelines, and investments in strategic action such as wetland protection, and transparent monitoring and reporting systems. Bill 24 proposed amendments to Manitoba’s Environment Act that would repeal legislated limitations to the hog industry’s growth and the ban on winter spreading of manure. Presenting to the Standing Committee on Legislative Affairs, LWF expressed concern about the lack of evidence behind the proposed amendments, and recommended that no changes be made to the legislation governing Manitoba’s hog industry until water-quality data is available to determine if current manure management practices are effective at keeping nutrients out of our lakes and rivers. Such data are necessary to determine how the industry may be expanding without increasing phosphorus loading to Manitoba’s waterways. The Manitoba government solicited public feedback on three inter-related watershed planning initiatives. Our submission recommends regulated, enforced protection for Manitoba’s remaining threatened wetlands, targeted investments in regions with reduced water retention capacity and/or high phosphorus loading, and program-specific monitoring to measure ecological outcomes. The Manitoba government solicited public input with respect to proposed amendments to existing regulation which dictates where, when and how livestock manure can be used as an agricultural fertilizer. Our submission notes a lack of information on the effectiveness of current and proposed regulatory measures to protect water quality. We recommend that no changes to regulation or associated legislation be made without first providing evidence that increased manure application will not result in a corresponding increase in phosphorus loading to Lake Winnipeg. The Manitoba government solicited public input on energy, land use and conservation measures as part of the development of a new Climate and Green Plan. Our submission focuses on protecting Manitoba’s threatened wetlands though strong regulation and strict enforcement. Specifically, we are calling for new legislation that ensures no net loss of water retention capacity on the landscape by putting in place a drainage moratorium on seasonal (i.e., “Class 3”) wetlands and strengthening protection of semi-permanent and permanent wetlands (i.e., “Classes 4 and 5”). Agricultural policy frameworks outline policy and program priorities to be delivered by federal, provincial and territorial governments in order to encourage investment, adaptation and sustainable growth in Canada’s agricultural sector. In July 2016, federal, provincial and territorial ministers of agriculture released the Calgary Statement, which outlines key priority areas that will guide the development of the next agricultural policy framework. LWF’s submission in response to this statement highlights the inextricable links between agriculture and water and the importance of protecting the ecosystems on which our prosperity depends. In advance of Budget 2017, the Manitoba government solicited input on how provincial spending should be prioritized, emphasizing themes of efficiency, opportunities for growth and Northern economic development. Our submission highlights the need for an efficient, evidence-based approach to improving water quality and flood protection. Presented during our introductory meeting with Manitoba’s newly elected Sustainable Development Minister Cathy Cox, this document identifies three opportunities within our eight-point Lake Winnipeg Health Plan for immediate, collaborative action to improve the health of our shared waters. The Federal Sustainable Development Strategy is an initiative of the department of Environment and Climate Change Canada, created to demonstrate federal leadership on climate change, provide priorities in response to the United Nations’ 2030 Sustainable Development Goals and establish measurable targets. A draft of the strategy was released for public consultation in early 2016. Our submission outlines challenges and solutions related to fulfilling our international responsibility to address eutrophication in Lake Winnipeg, and offered recommendations for implementation strategies. Reach out to your MP, MLA, city or First Nation councillor, local reeve or other decision-makers. Share your concerns about the health of our lakes and rivers – and your recommendations for solutions. Become a member of LWF and add your voice to our growing network of change. Support our efforts! Participate in one of our fundraising events or organize one of your own.